Today’s guest post has some lovely ideas on how to apply a coastal or nautical look to your bathroom this season. And if you to find lots more bathroom inspiration check out lots more posts here. Enjoy! What’s great about interior design is that whatever style you smother over a room; whatever colours; whatever accessories; no one batters an eyelid because your own unique modernisation cannot be questioned, and with bathrooms it’s no different. In fact, a bathroom is a prime example of a room that can adopt a particular design and style that quite simply wouldn’t be considered for any other room in your home because, for one reason or another, it just doesn’t work. Take a beach setting, for example. Or better yet, a golden Caribbean beach lapped by clear blue waters, sparkling in the mid-afternoon sun – not really a lounge design, or that of a kitchen; bedrooms may struggle with this too. Bathrooms, however, are a canvas waiting to be splashed with all the beach inspiration that comes flooding to mind when reading this sentence. So what are the key considerations when designing a beach-themed bathroom? 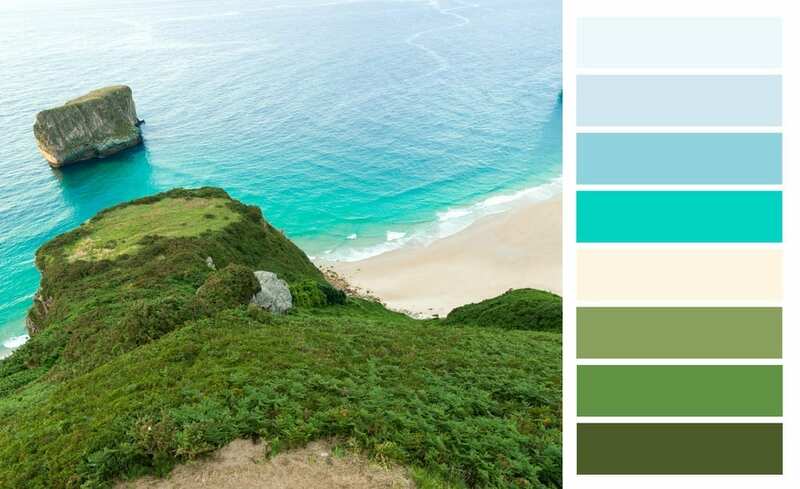 The two most prominent colours of a tropical beach should be the first terms factored into your colour palette. Holiday brochures do a visually stunning job of squeezing the finest details out of every last sandy shell and foamy wave crest, so much so that the reality always falls short. But there’s no reason why that should happen in your bathroom too. If a vibrant yellow is too strong for your bathroom floor, try sandy-coloured, easy-to-install vinyl flooring, or grainy mosaic tiles that resemble beach patterns and dunes. Blues are a lot easier to work with; all shades from navy to sky blue are found at the beach and a transition of tiles to paint up the wall creates a distinguishable Caribbean horizon. While most storage cabinets and vanity units, especially in wooden finishes, can be painted to match the beach colour scheme in your bathroom, imaginative storage solutions are the best option when it comes to catering for a particular theme. This all stems from your own personal views on what the theme means to you – the sights, sounds and even smells you expect to be immersed by. Some storage inspiration to help get you started are wicker baskets that come in either rectangle or oval shapes and perfectly complement sandy-coloured flooring. They are ideal for storing towels and toilet rolls, while smaller bathroom items like razors and toothpaste fit neatly into small metal or plastic beach buckets – bought especially for the new design or fished out of old holiday equipment if you’re working to a tight budget. This is where you can have the most fun and let your imagination run even wilder. Again, it all depends on what you perceive to be the perfect beach setting so take the generic sights and mix them with your own beach experiences to create a fully personalised design. Thankfully, many beach bathroom accessories can be found at great, affordable prices online. Palm trees act as the backdrop barrier to many tropical beaches, so pointy-leaved plants, whether real or fake, dotted around the bathroom give a sense of the Caribbean. If you’re stuck for space, however, or plants just aren’t your thing, fill plain wall space with stencilled palm tree designs. Smaller accessories can be items as simple as shells and mini starfish which sit perfectly on shelves, ledges and tops of cabinets, you’ll know if it’s overdone. For a host of other ideas and inspiration for your bathroom, visit the Bath House Online. We house a range of specially designed products and furniture for bathrooms of all sizes and styles. This colour scheme is amazing for a bathroom! It’s bright and colourful but light and airy at the same time.